Horses who do serious bucking need find a new home. Life is to short to be caught in this position. In part one we examined the reasons for and process of selling a good horse or more specifically finding it a good home. But in reality many horses are not really suited to their owners, and in fact often pose a threat to their health and welfare. This would exclude young and green horses that are reacting from fear and inexperience. And I would also point out these young horses should be trained by a skilled horseman, until they no longer bolt, buck, rear or kick and go quietly in complete compliance and control. The reasons to get rid of them are obvious, if you allow yourself to do a rational examination of the situation. In the case of a horse entrenched with the aforementioned behavioral issues, you cannot knowingly sell them to other recreational or armature horse owners. You have an inherent obligation to consider the potential customers’ well being and best interests. So that leaves a professional trainer who is made fully aware of the problems or a sale barn. A trainer will only pay you a very limited price, because he or she is assuming, that through a lot of effort, on his part, he might rehabilitate the horse. So expect to give this horse to a trainer if he will take him. It is OK as horse owners to set reasonable expectations for the horses, we provide homes for, and if they are not met, or if improvements are not being made, move them on down the road. There are a limited number of good homes for horses, and they should not be occupied by a horse who is not returning joy and cooperation to their owners. Having only good horses, means making an effort to only have good horses. It doesn’t happen by accident and it is not easy, and requires consistent disciplined effort. 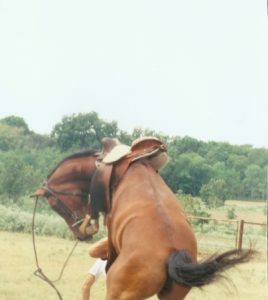 But it is this effort that makes time spent with your horse, more rewarding and safer.